Pinkadots Elementary : Spark Student Motivation Saturday (FINALLY)! Spark Student Motivation Saturday (FINALLY)! Well...I survived my first week (2.5 days) of school. I am all ready for next week, especially since we have Monday & Thursday off, and even have plans for the following week! I am sure I will have plenty of changes in my plan book. By the way, I am absolutely IN LOVE with my Erin Condren planner that I splurged on this summer. It makes me happy every time I look at it. Do you know what makes it even more exciting? When Robyn and I plan on Friday's with our Reading Specialist (who is also one of our BFF's) we all have the same planner! Our other teammate received her planner for a birthday present from Robyn and I and loves hers too! We were afraid to write in them at first, but erasable gel pens are GENIUS! I'm pretty sure this was posted before and I think it was either from my friends at Collaborative Cuties or Jivey, maybe even both, but since this works, I will blog about it again. :) Not only are colored pens fun for teachers, but they work wonders for students. This year my class HATES to write. When taking our beginning of the year classroom survey, 80% of the class put writing as their LEAST favorite subject. This is unacceptable in my class. I absolutely LOVE writing. We started with our writing territories this week and created our writing heart, a giant heart containing favorite memories that trigger emotions that would make potential awesome stories to write about. I made mine first and embarrassed myself over and over again telling my students silly stories about my life. I really do love this lesson because it really bonds us together as a class. They realize I am not perfect, they are not perfect, and we basically share stories verbally for the afternoon. 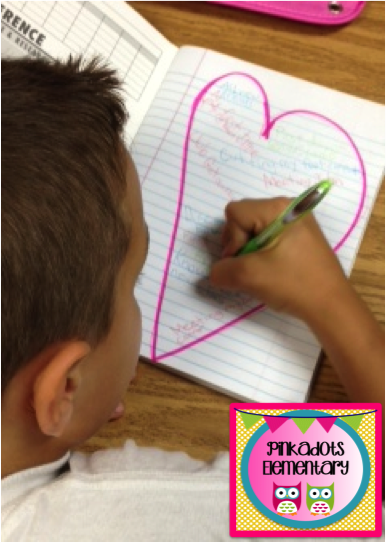 At first the heart was a turn off for the boys, but when I told the kids they could use colored pencils or colored pens to write down their memories they perked right up. "Can we use RED!?" is what I heard the most. I think they still associate a red pen with a grade, but I usually grade with pink or purple because they are my favorite and red seems so harsh! I gave my class ten minutes and then checked in with the students. I couldn't believe how many ideas they had written down in just ten minutes. Everyone was motivated, excited, and writing as fast as their little hands would move! As an added bonus, check out my classroom door! This is another student motivator. 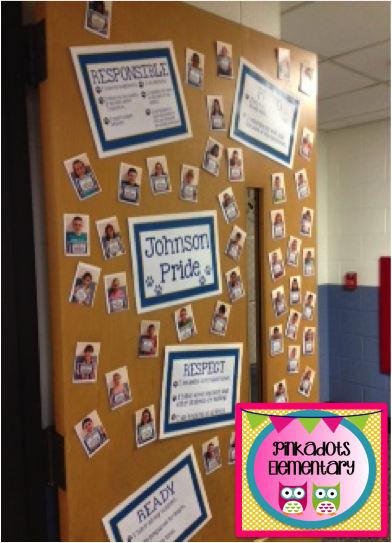 We use a PBIS system called Johnson Pride. Our School is Johnson School. I made my students a sign for the first day of school that said, "My first day at Johnson School!" and took their pictures holding the sign. (Our school is only 4th & 5th grade.) I gave each student a print of the picture to take home to their parent on the first day and put another copy up on the door. Looking back at these pictures throughout the year are amazing. It is crazy how much my little fourth graders will grow in just a few months! When students show Johnson Pride, they get a Pride sticker and slip. When they fill out the slip (saying what they received the sticker for) they enter it in a raffle in the office. The principal calls winners from the raffle every Friday for prizes. The students also get a "footsie" a little plastic paw that goes on their shoe lace. The kids LOVE these. While walking in the hallway and looking at feet, you can tell who has received a ton of Johnson Pride stickers and who still might need some support and encouragement to earn one. Happy Saturday! I am now off to enjoy a fun filled day of finding tag sales with the family and spending some time on the lake! I love your door and I just realized I forgot to take individual pictures the first day! Tuesday for sure! Isn't it amazing what pens can do to motivate students? That's one of my top prizes in my class! 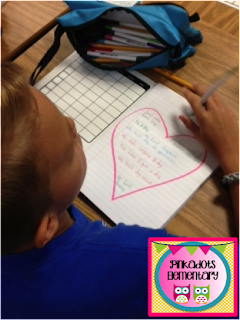 :O) I love the heart map activity! And, you're absolutely right, it does bond you with your class-they love hearing our stories! Thanks for sharing and linking up friend! I love letting kids use pens. It is amazing how much that motivates them! I love the idea of erasable gel pens... I need some ASAP for my planner and my kiddos! What brand did you buy? Great idea for motivation :) Thanks for sharing! I always use purple to grade, too! I love writing with pens...it only makes sense that students would too. You are brilliant. I'm busting out the pens on Tuesday! Thanks for sharing!